See YouTube video - Half court press. X3 (a long defender) starts in the frontcourt between the circles. 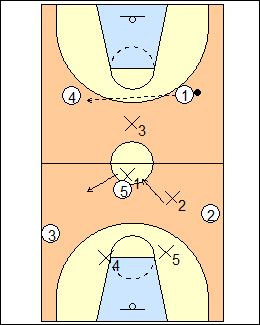 Guards X1 and X2 are about 1.5 metres behind the halfcourt line (more like 2 metres in the video), about the width of the lane lines of the current rectangular FIBA key (not shown). They are quite tight, encouraging the offence to take the ball into a trapping area. X4 and X5 are about on the elbows of a current FIBA key. There are 4 trapping areas, just over halfcourt on each side, and in the back corners. 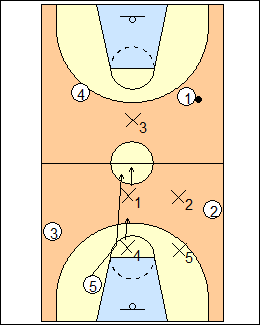 Tubby Smith - 3-2 extended - it's not a trap unless the ball is dribbled into the frontcourt near a sideline. 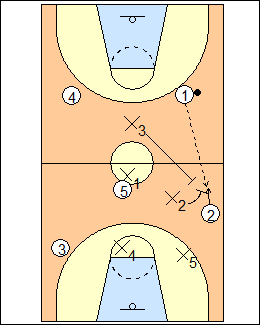 Tar Heels scramble - trap on the first dribble in the backcourt (32), trap on the first pass made in the backcourt (42), or fall back into the halfcourt defence (22). George Mason scramble - trap on the first dribble over halfcourt (thumbs up), or the first pass in the backcourt (thumbs down). 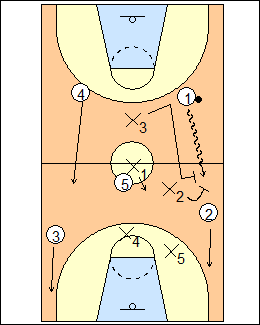 See Defences - 3-2 Tubby Smith, Tar Heels scramble, George Mason scramble, 1-2-2 slider halfcourt, 1-2-2. Defenders show and play it like a man-to-man, e.g., here X2 soft denies 2 (down in a stance), X5 takes away a pressure-release pass over the top, weakside X1 and X4 get to the split line. X4 sees the whole floor, including a flash by 5, defends it, then hands him off to X1 at about the top of the key. Often a pressure-release player will flash to about the halfcourt line, don't allow that pass. X3 tries to determine if the point guard wants to dribble or pass the ball across halfcourt (e.g., does he have his head up, looking upcourt, or has not started his dribble). 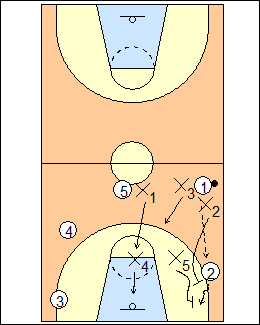 If 1 wants to dribble across, X3 gets on his hip and channels him to a trapping area (don't let him come back middle), X2 hedges and recovers, traps the hell out of 1 as soon as he steps across halfcourt. X2 doesn't come up too soon, or 1 will try to play both sides of the floor (while still in the backcourt). X3 doesn't backpedal against a dribbler, or run up on him. On any trap there is a channeler, a trapper, and three rotators. Here X5-X4-X2 are rotators, taking away any pressure release up the sideline or to the middle. Hoop Tactics - to protect a deep skip pass to 3, have X1 rotate to the high post (allowing a pass to 5) and X4 drop to a low helpside position. They want to rotate into at least two traps. If the ball goes over your shoulder you rotate to a second trap, so X2 follows a pass to trap with X5, who gets on 2's hip and channels the ball into the corner. Trapper X2 gets a good angle, if he runs straight at the ball, there's a good chance that 2 will be able to split the trap. Variation - X3 traps with X5 (if you see it, you get it). 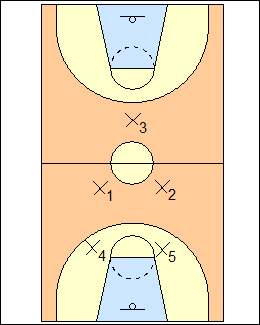 X4 rotates to low split (middle), X1 rotates to high split, X3 rotates in and guards two players, 1 and 5. Williams - after trapping on the first dribble (32), they don't trap again. Smith - trap again on a pass up the sideline. Jim Larranaga - thumbs up becomes thumbs down. Jim Calhoun - this is the best percentage trap for steals. X4 covers low middle, X1 has high middle. X3 is the interceptor, he takes the nearest pass. See Defence - 2-2-1 UConn. X3 stays between the circles if he establishes that 1 is a passer (don't run at him), then traps with X2 on a pass over halfcourt into a trapping zone. X5 has no one behind him. Dean Smith - 32 becomes 42 on a pass across halfcourt. See Defences - Black and Grey, also 2-2-1 Oakland. Defenders just change jobs if 1 makes a cross-court pressure-release pass to 4. X2 has to release X1 and deny a pass to 5, then X1 can adjust to a position about 1.5 metres behind the halfway line. X1 may be able to release early if 4 is not looking at 5. It's good for the defence if 4 makes a return pass to 1, they are running out of time. Hoop Tactics - X3 can play between 1 and 4, disrupting ball reversal and forcing 1 to advance the ball on the dribble, or drop back, allow a reversal pass, and wait for the ball to cross halfcourt before trapping.